I’m amazed at the number of comments I’ve received on this blog. Fantastic! I had imagined I’d write posts for months before I had any response & that it would probably come from a friend who felt obliged to give me some encouragement. How little I know about the world of the internet! Also, it is wonderful to realise that people both near & far have read my books & found them useful. As an author one hopes this may be the case but to get some feedback is really great. I do so appreciate it. And so many links to other websites! I fear I may never find time to write my posts, if I allow myself the luxury of looking at them all. How do people do so much? However, I’m now faced with a quandary regarding “blogging etiquette”. Will I be considered rude if I don’t reply individually to each comment I receive? This is what I’ve tried to do so far. But will I find myself in the situation of thanking people for thanking me for thanking them? I can see that this might become irritating for all concerned. Perhaps the correct thing is to issue a “General Thanks” post from time to time & to only reply to comments that ask for a response or raise a particular issue? And of course, in order to write posts I’ll need to find time to do some more experiments so I have new things to write about. This will clearly require some careful thought! I’ve been trying out two more extracts, rhubarb root & cutch waste. Rhubarb root is a useful & versatile dye, so I was pleased to see that it is available in extract form from Pure Tinctoria. Among the other extracts on their list I came across “Cutch Waste”, which intrigued me. Cutch, rather than cutch waste, gives rich browns on all fibres &, like rhubarb root, can be used without a mordant. Cutch is one of the few dyes that has been available in extract form for very many years. In fact, I have never come across cutch in any other form. It is produced by simmering the heartwood of Acacia catechu (native to India & SE Asia) in water, then reducing & evaporating the liquid until it becomes very thick. It is then poured onto matting & left to dry & harden into a solid mass, which is cut into chunks, then powdered. Just where the cutch waste comes from, I’m afraid I don’t know. Another puzzle to be solved! I first came across rhubarb root as a dye some years ago in an article in the Weaver’s Journal. The article was about Tibetan carpet weavers working in Nepal, for whom rhubarb is a vital dye plant. The leaves contain oxalic acid, which they use as a kind of mordant or base for other colours. They also add rhubarb leaves to organic indigo dye vats to assist fermentation. The rhubarb root is used for yellows, rusts & as an addition to brighten madder dye baths. The article suggested alum might be difficult to obtain in Nepal, unless from plant sources such as the leaves of plants that absorb aluminium from the ground, & therefore most dyes were used without a mordant. So I experimented widely with rhubarb root on unmordanted fibres, as it is so useful to have a source of yellow that doesn’t require a mordant, especially in order to obtain a green when overdyed with indigo. However, I have to say that, although rhubarb root dyes wool & silk excellently, it is less effective on cellulose fibres. I tested both these extracts on wool without a mordant & with an alum mordant. Both fixed well without a mordant. The rhubarb root produces a clearer yellow without a mordant & a more mustard shade on an alum mordant. The cutch waste shade is an attractive soft greyish green, (more green than grey, however) very useful as a contrast to more vivid colours. Unfortunately, the photo doesn’t really do justice to the colours. Rather foolishly, I didn’t try out any colour modifiers with these extracts. I don’t know why, as I usually do a full set of tests. Rhubarb root in its plant form reacts well to modifiers. It gives moss green with iron, a brownish (taupe?) shade with copper & shades ranging from red-brown to red with an alkali such as washing soda. Truly a versatile dye. (More details on using modifiers in the entry about dahlias.) So now I must do these tests with the rhubarb root extract, to see if it reacts in the same way. In my experience, not all extract dyes respond as well to colour modifiers as their plant counterparts. I think this is because some extracts are treated during the production process to reduce their sensitivity to changes in pH values & thus make the colours more stable if washed, or otherwise treated, in a non-neutral medium. I routinely wash naturally dyed fibres in dishwashing liquid & I have yet to find a dishwashing liquid that is not pH neutral when in solution. Some extracts are also probably treated during manufacture to remove some of the less desirable pigments. This would explain why madder extracts vary so much from one production company to another. The more recent Earthues madder extract gives a wonderful clear rich red, while their earlier madder extract was much more orange in tone. 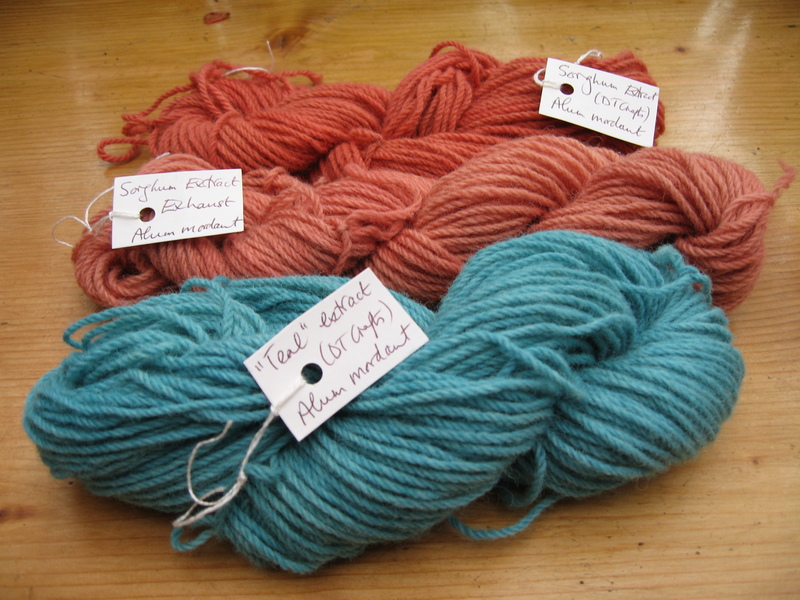 Some other madder extracts also produce more orange/coral tones, which can be made pinker/redder in tone by using a washing soda after-soak – but NO heat particularly if dyeing wool. More about extracts when I’ve done some more tests. How wonderful! Today I have received several messages in response to my blog! 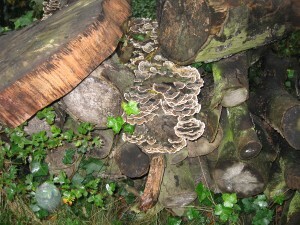 I’m thrilled that there are actually people out there who have found my blog & have taken the trouble to send comments. Thank you all so much. This will encourage me to keep on writing my posts. Although nothing can quite compare with growing one’s own dye plants & being able to complete the dyeing process from start to finish using home-grown materials, I am very enthusiastic about the natural dye extracts now readily available on the market. These extracts are extremely versatile & easy to use & all the classic, traditional dyes are now available in extract form.They dissolve in water, so there is no need to simmer the dye materials to extract the colour, and 2 or more extracts can be mixed together to create further shades. Although they may appear expensive at first glance, in fact they are good value as very little is needed for full colours. I have written about extract dyes in “Colours from Nature”, my latest book, which gives full details for their use. More recently I have been trying out some new extracts. In the photo above, the upper 2 samples have been dyed with “Sorghum” extract (the lower of these 2 samples is from the exhaust dyebath) & the lowest sample with “Teal” extract. These are both available from DT Craft & Design. Sorghum, or Guinea Corn, Sorghum vulgare, is an interesting source of dye colour, as well as being a foodstuff. Native to parts of Africa & Asia, Guinea corn was also introduced elsewhere, including Europe & America. Although it is not well-known in Europe as a dyestuff, it was used to dye wool in Egypt & in Sudan to dye reeds & grasses for matting. It was an important dyestuff for both textiles & leather in other parts of Africa & was also used in Japan & China. Sorghum has good fastness properties. The parts used are the stalks, leaf sheaths & corn husks. 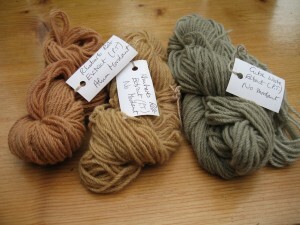 On wool, sorghum extract gives colours similar to the rust shades from madder. I tried it both without a mordant & with an alum mordant & found the colours were virtually identical, so a mordant may not be necessary. “Teal” extract is intriguing, especially as so far I have not managed to discover the plant sources from which the colour is made. I expect this is a trade secret. But it gives a beautiful green/blue/turquoise shade, which is a rare colour from natural dyes &, in my experience, only possible when indigo is used in combination with at least 1 other dye. More about extract dyes later. 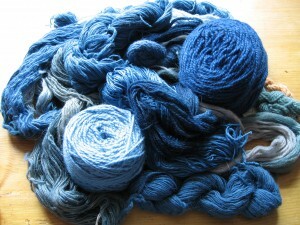 During my recent woad-dyeing session, I happened to dye a skein that had been mordanted with alum. I was interested to observe that this alum-mordanted skein dyed a greener, more turquoise shade of blue than the unmordanted skeins. I wondered how I had failed to notice this shade difference before. I can only explain it as follows: Usually, I use unmordanted skeins for indigo & woad dyeing, unless I am using indigo to over-dye a skein already dyed in a dye that requires a mordant. As I always use indigo as the last dye in a 2 or 3-dye sequence, I suppose this was the first time I had used an alum-mordanted skein that had not already been dyed. As to why I always use indigo as the last dye in a sequence – I think this is because the depth of colour from indigo is easier to control than the depth of colour from other dyes. So by using indigo as the last dye, I can dip for a short time initially & then build up the colour gradually. I usually also reserve the other dyebath, in case I need to add some more of the first dye after the indigo (or woad) dyeing process. Just as I’d finished writing about my latest woad-dyeing session, I received 2 emails with queries about woad. A lady wanted to know how to use the woad balls she’d purchased & a gentleman wanted to know more about Watchet blue. As far as using woad balls is concerned, I think the best way to do this would be to follow the method I gave in my entry on Woad Dyeing in November. But before pouring hot water on the woad balls, crumble them into small pieces. Then pour on the hot water & continue as for fresh leaves, perhaps returning the leaves to the vat after the whisking process & leaving them in during dyeing. If you don’t add the leaves to the vat, don’t throw them away, however, as it may be possible to re-use them for paler shades. This is the method I used when dyeing with indigo balls from Nigeria & it seemed to work well. Watchet blue would seem to be connected with Watchet in Somerset, where cloth was manufactured in mediaeval times. Woad was grown in Somerset, particularly around Glastonbury, but I don’t know whether Watchet had a connection with woad dyeing. From the 12th century, “watchet” was used to describe a particular shade of blue from woad, probably a mid to light shade. Watchet blue is mentioned by Chaucer & Shakespeare & apparently both Mary Queen of Scots & Charles 1st wore items of Watchet blue for their executions. (Mary wore blue stockings & Charles wore a blue knitted waistcoat.) The name might also be connected with the fact that small boats called “Watchet flatties” were traditionally painted Watchet blue. John Edmonds, in his book on Medieval Textile Dyeing, devotes a paragraph to Watchet Blue. Unfortunately my woad plants were ravaged by caterpillars this year, so I wasn’t able to harvest my usual heavy crop of woad leaves for the dyepot. The best time of year for harvesting & using the leaves is from late August/early September to the end of October. This gives the leaves time to develop their blue pigment. However, I have successfully used leaves for the dye vat at most times of the year, so it’s always worth using any leaves you can find, no matter the time of year. Also, although first-year leaves are generally recommended for the strongest blues, I have managed to obtain good blues from second-year leaves. Some of this year’s leaves were picked for a demonstration of woad dyeing in September at Denny Abbey in Cambridgeshire, where I regularly tutor natural dyeing courses. The last few remaining leaves were harvested this week in the pouring rain, ready for a woad-dyeing session with Chris Dobson, friend, fellow-dyer & plant expert. Fortunately, Chris brought with her some really large, “meaty” leaves to add to my rather pathetic specimens. Collect about a bucketful of leaves, tear or cut them into small pieces, pour boiling water over them to cover them & leave them to soak for about an hour. 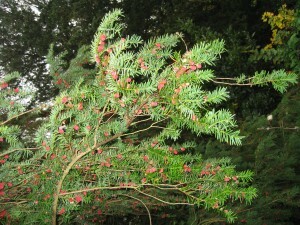 Then strain off this liquid into another bucket & squeeze the leaves well to collect all the possible colour potential. Next, add enough washing soda crystals to turn the liquid from brown to green. To incorporate oxygen into the liquid in order to “activate” the blue, the liquid must then be poured from one bucket into another until the froth turns blue. Alternatively, the liquid can be whisked well. The process must be continued until the froth no longer turns blue & this can take quite some time. But persevere, no matter how much your arms ache, otherwise much dye potential may be wasted. After this pouring process, leave the liquid to stand for a while to allow the froth to subside. Then pour the liquid into a stainless steel dye pot & heat until the liquid is so hot that the heat is only just bearable to the hand. (Approximately 50C) Then add 2 to 3 teaspoons of sodium hydrosulphite to remove the oxygen & leave the vat to rest for about 20 minutes. By this time the liquid below the surface should be greeny-yellow & the vat is ready to use. Remember it is important not to introduce any oxygen into the vat, so add the materials to be dyed very gently so as not to cause bubbles. Leave the materials to soak for 5 to 20 minutes, depending on the depth of colour required, then hang them in the air to allow the blue to develop. 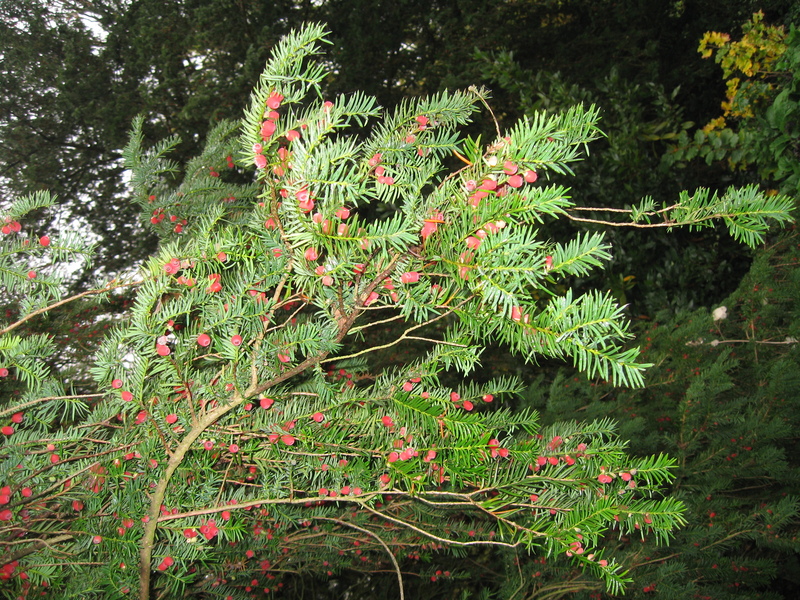 While visiting The Manor at Hemingford Grey (see entry on Bracket Fungus for more details) I saw a wonderful spreading yew tree (Taxus baccata) in the secret garden. This reminded me that yew wood shavings can give lovely orange & rust colours in the dyepot. So if you know a woodcarver, or have some other source of yew wood shavings, collect about the same weight of wood shavings to fibres you wish to dye & start off by pouring boiling water over the shavings & leave them to soak overnight. Then simmer the shavings for about 1 hour & pour off the liquid to make the dyebath. Use wool mordanted in alum – I usually use 10% alum i.e. 10gms alum to 100gms wool – & simmer the wool in the dye solution for about 30 to 45 minutes. Leave to cool before rinsing. You can also experiment with colour modifiers for variations in shade. (See entry on Dahlias for further details). Last week I took my husband & a friend to visit The Manor at Hemingford Grey, near St. Ives in Cambridgeshire. This remarkable house, parts of which date back to 1130, is probably the oldest constantly inhabited house in England & was the home of the author Lucy M. Boston until her death in 1990. The Manor is now the home of Lucy Boston’s daughter-in-law, Diana Boston, & can be visited by appointment. It is difficult to describe the magic & atmosphere of the house & its gardens. The house is full of memories of Lucy Boston’s fascinating life & personality & also contains many of the items Lucy wrote about in her Green Knowe series of books for children. The garden is a wonderful, magical environment. The more formal areas include collections of beautiful & rare roses & bearded irises & some fantastic examples of topiary. But it is the secret garden which particularly attracts me, with its moat & trees providing shade & mystery.